Ardabil rugs originate from Ardabil located in the province of Ardabil Province in northwestern Persia, 639 kilometers from Tehran. 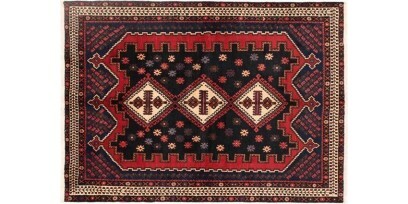 Ardabil has a long and illustrious history of Azerbaijani carpet weaving. The reign of the Safavid Dynasty in the 16th and 17th centuries represented the peak of Azerbaijani carpet making in the region. The name Ardabil comes from the Avesta (The sacred book of Zoroastrians) with the word Artavil literally meaning a tall holy place. The weavers in Ardabil ply their craft using Azerbaijani knots. One of the most famous carpets in existence today is a pair of Persian carpets from Ardabil. This carpet, measuring 34' x 17', is hanging on display in the Victoria and Albert Museum in London, England. Ardabil rugs feature motifs that are very similar to Caucasian rugs, but with more motifs and objects woven into the borders. The colors are also lighter. The patterns are predominantly geometric and the most common layouts on Ardabil rugs are medallions, multiple connected diamond-shaped medallions, and all-over octagonal shapes. The most recognized design found on Ardabil rugs is the famous Mahi (Herati) design - a diamond medallion and small fish throughout. Some modern weavers have begun to favor bold geometric patterns over the traditional Mahi (Herati) design and have added colors such as turquoise and purple to the more traditional red, pink, ivory, green, and blue. The warp on Ardabil rugs is mostly cotton, while the weft is either cotton or wool, although silk is also used as weft on fine Ardabil rugs. The highly skilled weavers may also incorporate silk into the woolen pile in order to accentuate some highlights in the pattern. 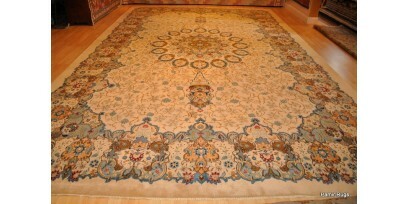 These fabulous rugs are available in all sizes.